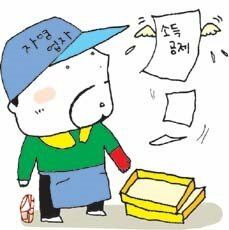 A cartoon of a self-employed (chayôngôpcha) in the Kyunghyang article: keeper of an eating place is representative of one. What the self-employed are able to deduce is the national pension (kungmin yôn'gûm) payment, and donations to social welfare organizations of the national or regional governments and religious organizations. Also pension savings (yôn'gûm chôch'uk) are deductable. And moreover, the more the sales are done using documentation, the more deductions can be made, and same goes with keeping books (changbu). But I guess the small businesskeepers know how much of their sales is worth putting in books and how much is better left unrecorded - I've never known Koreans as happy taxpayers. Hankyoreh features a bookshop keeper who after 27 years of keeping a shop in Yaksu-dong cannot feel having done any contribution to culture, only remorse (huhoe) after all those years of toil which have only piled debt on him. The dire economic conditions of small bookstores and their increasingly decreasing number has been an issue already in the 1990s even before the economic crisis and the appearance of internet bookshops, but since the end of 1990s the business of small bookshops has really collapsed. From close to 5400 in 1996 the number of bookshops has dropped to 2200 in 2003. One of these was a shop in Sillim 2-dong whose keeper I acquainted to some degree. The shop has the same as the one in the Hankyoreh article, except for the word for bookshop (sôjôm vs. mun'go). They surely wouldn't have survived even that long hadn't they been the owners of the house with three other shop spaces. At one stage when they couldn't find anyone to rent one of the shops, they themselves kept a "dance room", which the man told seemed to be a better business than the bookshop. In Yaksu-dong where Hyôndae Mun'go is there were eight bookshops in the late 1980s, but at the moment only three are left. Where bookshops used to be are now chicken places, eateries (punsik) and clothing shops. The bookshops that are left survive by selling reference books (?, ch'amgosô. "Earlier I used to recommend good new books for regulars, and could spend hours just debating. Just seeing schoolkids after classes browsing books without buying anything gave me such a good feeling, but now those feelings have disappeared from my business." Hankyoreh is surely in a morally correct position in proposing that a policy for the survival of small neighborhood bookshops is urgent, but for all my sympathy for the small businesskeepers of all kinds, I can't see how the shops can be saved in any large scale with the present preferences of customers. What the representative of the bookshop association can appeal to are the concepts of neighborhood (tongne) and local society / community (chiyôk sahoe), in which the small bookshops can allegedly pay an important role as "cells of local culture." What did I by from Mr Kim's bookshop in Sillim-dong? Magazines every now and then, perhaps one children's book to give as a present. The first book for myself from the shop I received for free when the woman of the keeper wanted to give one as present. There wasn't much that I was interested in, but I took a collection of essays by Ma Kwang-su. One of the more amusing and interesting googlings ever to give hits to this blog: "my thesis concerning women on submarines". World of unexpected randomness, post-post-modern hybridity and blurring of genres between blogging on Korea and gendered space in submarines. Their most frequent method of tax evasion was to refuse credit cards and have customers use cash. Many clinics put emphasis on doing treatments not covered by insurances, and in the case of lawyers, did not declare the consultation fees. [...] There were also cases of evading taxes by having a salaried doctor or lawyer work as a stooge representative for the business. The same issue was discussed a week ago in an article and an editorial of Kyunghyang Sinmun after the National Statistics Office published a survey on household taxes and consumption. The monthly taxes paid by self-employed families paid were 43% of taxes paid by salaried families, and yet the monthly expenditures of self-employed families were slightly higher. 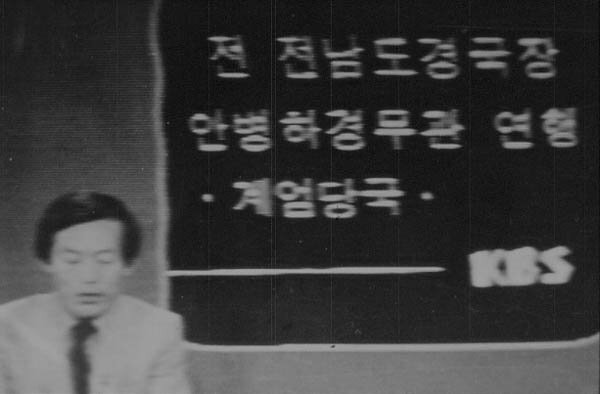 I picked up several photographs from the archives of Kwangju Minjung Hangjaeng Sigak ônô Kongjang to illustrate my class on the Kwangju events of 1980 and its effects, among them screenshots from KBS news (see archive page) on May 27 which conveys the info from the martial law command (Kyeômsa). One screenshot was about the arrest of the former Southern Jeolla police chief An Byeong-ha. I didn't give a further thought (read: considered that I had already used enough time to prepare the lecture) to it, but accidentally Ohmynews carried the very same day a piece of news that the named An, who had been arrested at the time of the final suppression of the uprising for having refused orders to suppress the demonstration by very harsh means. According to another article, An had for example ordered the police not to carry arms when the paratroopers were on the rampage in Kwangju. Soldiers arrested An and took him for questioning; he died in 1988 never recovering physically from the torture. As part of the restoration of his honor, he will be reburied to the National cemetary (Hyônch'unwôn). A chapter by Lee Jae-eui (writer of Beyond Death, Beyond the Darkness of the Age) mentions that one reason why student demonstrations in Kwangju before the crackdown on the 17th were not violent (unlike the demos in Seoul) was because of cooperation between An and student leaders. "My husband died in 1988. Before his death he used to say that he decided to protect the citizens of Kwangju from the brutal martial law army. He declined to obey an order from the army to suppress demonstrations in Kwangju. His actions embarrassed Martial Law Command. That was why they immediately arrested him. He was ferociously tortured and quit his career. He was sick in bed for years." The book Matt quotes is The Kwangju Uprising: Eyewitness Press Accounts of Korea's Tiananmen (ed. Henry Scott-Stokes and Jai Eui Lee). I've never found the designation "Korea's Tiananmen" really satisfying; not that the both were not large-scale atrocities perpetrated by the government, but to define the events of Kwangju by a place of similar violence which took place nine years later doesn't go the right way. It should perhaps be other way around, except that at least at the moment I'm not aware of any democracy movement in the name of "Tiananment spirit". Tiananmen of 1989 hasn't been China's Kwangju this far. Flying Net, "urban information network" (도시정보 네트워크), has been carrying a series of interviews under the title "Urban Scenes" with artists who paint - urban scenes. (Jeongjikseong (Honesty), whose painting I quoted last month, has been one of them.) Jung Jae-ho was the sixth interviewee. He (most likely "he" judging from the name) paints cityscapes in a naturalist manner which for a layperson like me become sympathetic, a bit nostalgic, even sentimental statements of the kind of cities Koreans have been living in for the last decades. Even though the header photograph of my blog is from the south of the river, it's not from "Gangnam", so readers surely understand why I've chosen to link this painting, "Hymn for Gangbuk". (Go to Jung Jae-ho's own blog and click the pic for a bigger reproduction of this painting.) I don't know if these photographs, originally on display in Flying City, have been an inspiration to him, but I'm reminded of them and the feelings they bring when seeing this picture and others by Jung. One series of paintings which he exhibited last year is titled "Cheongun Citizens' Apartments" after an apartment block Cheongun-dong, Jongno-gu which was demolished last summer. After visiting the painter's own blog, I see that he has been doing a lot of visiting in old apartment areas often to be demolished in the name of development. There are photographs of the Cheongun Apartments before demolition at Seoulscrap webzine: scroll down to the third series of pics. It's not often that news or articles concerning t'ongjangs, "neighborhood heads" on the second-lowest formal level of administration (panjang, "head of pan, is the lowest) come to my attention, but when that happens, I'm happy to give a note. That brings me nice memories, as some neighborhood shopkeepers I did research with called me teasingly t'ongjang for going around in the neighborhood and finding out about things. This small, seemingly unsignificant piece of news by Hankyoreh tells of Ms Kim of Daechi 2-dong, Gangnam-gu, who lost her post as a t'ongjang due to a friction in the apartment residents' association (ipchuja taep'yohoeûi) after which a complaint concerning her was filed to the ward (tong) office. Mr Kim was dismissed from her t'ongjang post, but she later won a defamation suit in court against those who filed the complaint and had spred false stories on her in the apartment block. I understand that it's not so much about the post itself, the remuneration a t'ongjang gets is low - but that she was dismissed on grounds which were later judged as libelous in a court. Mrs Kim had first been a panjang for five years after retiring from teaching in an elementary school, and later become a t'ongjang, which she felt was a rewarding task: "going around in the neighborhood I got to know things well, befriended many neighborhs and felt worthy." Perhaps it's not advantageous for my scholarly credentials to admit browsing the net for class preparation sources, but since the present-day attitudes towards issues of contemporary Korean history are a vital part of the classes, online sources are important, right? I guess it's the combination of conservatism of the newspaper and hostility towards MBC that has made Chosun Ilbo to have the "news" about brief appearance of pubic(*) hair in a MBC drama on the top of its newspage. (Most of the other main newspapers also carried this, but in much more smaller type.) It was a bathing house scene in Talk'omhan sûp'ai (Sweet Spy), in which Ch'oe Puram (it seems I'll never grow up not think of pural here) and other were rubbing each others backs, and an extra moved a bit carelessly in the background. (*)I once had "pubic discourse" written in a conference presentation. I'm sure readers understand that I wasn't talking about Korean sexual politics - typos like that just don't show up in spell checkers, and such Freudian (?) slips perhaps appear as proper compounds ("public discourse") even for native readers since it's such a common phrase - this judging from not seeing amused smiles during the presentation at that passage (or they just weren't reading). 1) CONTENT - To bring together graduate students and scholars who study Korea on a single group blog to share information about their own research, passing discoveries they have made, and an opportunity to discuss and critique current research and scholarship in our field. In addition to our own research, we may end up posting links to other articles, write reviews of books read or presentations attended, make comments on interesting passages found in the archives, and information on useful resources available to those interested in studying Korea etc. This is primarily a weblog about the history of Korea but we will be welcoming contributors from other fields or who are working between them. Some of us already dabble in literature, anthropology, and other areas and all of us can benefit from rich interdisciplinary interaction. The guy had been the submarine’s navigator, and had lived on a North Korean naval base since the age of 14. Subsequently he knew very little beyond daily life on the base, and he was unfamiliar even with what the rest of North Korea is like. For example, he didn’t know what money was. He’d never needed any. When the South’s intelligence agency was done interrogating him and it came time to give the poor guy some orientation about South Korean society, one of the questions he asked at the end was how some bills could have more value than others when they’re all the same size. Shouldn’t the paper that you can buy more soju with be bigger? When I met him we were also in the presence of a lady, yet he frequently reached down and scratched or held his privates. He had a lot of questions for me even though I was there to interpret. Is South Korea so expensive because there are so many foreigners here? Does each star on the American flag representone of the wars it has won? What happens if you don’t have the money to pay for the subway? Do South Korean women like men who wear ties better than those who don’t? Oranckay also links to the news that the person in question got a M.A. in political science last August. 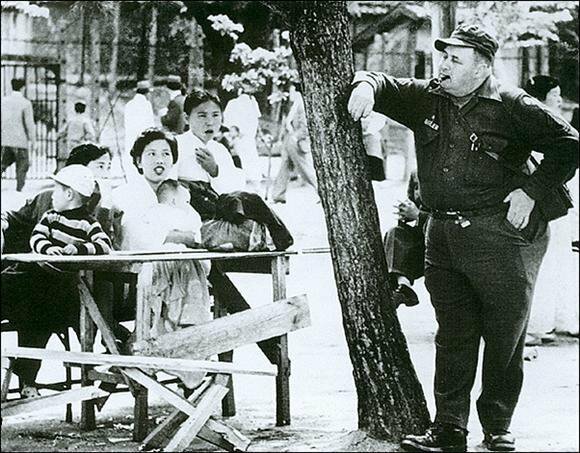 North Koreans, the last tribe that the anthropologists have not yet been able to discover. I can just imagine the fervent rush of the researchers to the North once the system changes. The Chosun article presents situations in which the low-earning husband has no more any say in the household matters; as I said, that's a human-interest point of view, while in practice the situation may be more balanced as well. The well-earning self-employed women do have their assertiveness and somewhat belittling attitude towards their husbands, but not in their (and my) presence, when the men's and women's roles are let's say better preserved. The research that inspired the article by Chosun was article ‘기혼여성의 경제적 지위’ (direct link to the article as pdf; "The economic position of married women") by Hwang Su-gyeong in the September 2005 issue of Nodong Review, published monthly by KLI. Ohmynews has an story of closing a video shop after 12 years of operation, written by the keeper herself. The income from the shop - not more than 800 000 W a month in the better times in 1990s - had now dwindled to some 240 000 a month. The shop, originally only 5 pyeong (17 sq.m) seemed to be getting established, when they had to face competition from a 40-pyeong shop across the street. They expanded to the emptied shop space next floor, and managed to make profit after hard work, but the better times did not last long. The big competitor across the street closed, which was a sign of the decline of the whole branch facing new forms of entertainment (games) and new routes of more or less legal distribution (internet). 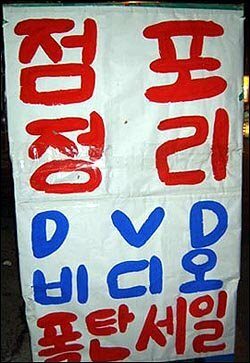 Most of the video shops in the vicinity have closed. It's not only me, but many self-employed around here are having a hard time. Sighs like "it wasn't this difficult even during the IMF" can be heard everywhere. Changgyeongwon, Seoul in 1957. Photograph Yi Hyông-nok. More photographs from the 1950s by Yi Hyông-nok in the 맨날 추억에 사네 blog. Pressian has an article on old people collecting wastepaper to earn even a tiny income. It is stated that it'd be a new phenomenon, but I recall seeing a lot of that already in the 1990s before the crisis. Must be also the neighborhood in southern Seoul where I've resided, with relatively many poor old people as far as I know. Many of the wastepaper collectors fall outside the government criteria for welfare recipients, like being owners of property like car or house or having children who are legally obliged to provide the livelihood. Grandfather Im owns an apartment which he bought with his retirement pay. He lives there with his wife and two sons who both are handicapped and unable to work. The sons are provided some welfare assistance by the authorities, but the ownership of the apartment disqualifies Mr Im from being a recipient himself. Grandfather Im is the head of his family responsible for its livelihood. He gives the impression of responsibility. He says he earns almost 10 000 won (8€) a day by collecting paper. As the price for waste paper is 50 won a kilo, it means he collects about 200 kilos a day, which is hard to imagine for his 65 years of age. For this, he leaves home early every morning and doesn't rest even on Sundays. There are some who collect paper to get exercise or to be as small burden for their children as possible, but for the most of them it is an unavoidable means of livelihood. How to put it - falling between the idea of Confucian filial piety that the official welfare policy maintains and the differentiation of generations and nuclear families and the lack of comprehensive welfare system (or even citizen's pension system). What a lefty government the Republic of Korea has. A critique by Pak Yong-jin of the Democratic Labor Party on his on party after the lost election in Ulsan (via Jinbonuri). According to Pak's own page (here and here) his opinion has already drawn attention from the mainstream press. No wonder, since one doesn't see a DLP member of some prominence demand, among other things, that the party break its silence concerning DPRK. There is also another taboo which needs to be broken. [The first was critique of KCTU, 민주노총.] No citizen will support a party which cannot utter any critique on the North Korean declaration of possession of nuclear arms. The party (DLP) needs to have a discussion and formulate an opinion on the questions of the return of kidnapped fishermen, human rights of North Korean refugees, workers' rights, democracy, and the DPRK political system. These are issues which no more shall be avoided on the pretext of causing discomfort to DPRK. A reasonable critique of the views of prof. Kang Jeong-koo in the current Hankyoreh21 weekly by the history professors Pak T'ae-gyun (SNU, Kor.hist.) and Yi Wan-bôm (Academy of Kor.Studies, Korean pol.hist.) in a discussion with the mag editor. There's nothing new for those who have enlightened themselves on the topic of post-liberation Korea and the occupation regimes of USA and Soviet Union, but it's good to have it open also in a Hankyoreh-affiliated publication. The other of the discussants says that what Kang has been saying in his most commotion-generating texts is so much Cumings that he should have credited him in a footnote or something. 한국보수신문들은 자주 "라면 통신"이라 비판하면 강 교수는 "만약학자"라 부를 만하네. "만약 그렇다 저렇다 안 했으면 그랬을 거다"라고 글을 써대는 만약학 교수. 아니면 가정법(家政 아닌 假定) 학자.